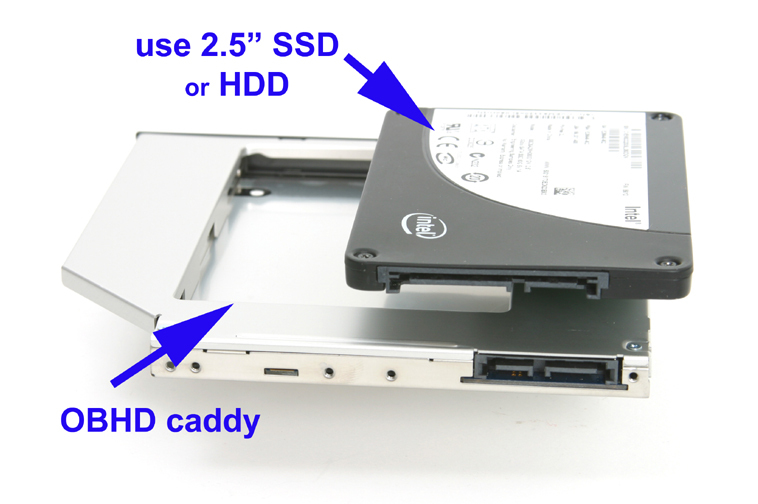 Add a Second Hard Drive (drive size up to 12.7mm in height) to your Samsung Series 3 (NP300,NP305,NP350) laptop using your laptop's optical drive bay. Add it as a second drive in the laptop in lieu of the SATA Optical drive. This device/caddy will fit in the CD/DVD/Optical drive bay in your laptop. Simply pull out your CD/DVD drive and replace it with our OBHD Optical Bay Hard Drive caddy. The front faceplate is rectangular, flat and has a Black finish. You can also transfer your optical drive's "original faceplate" to our caddy for that more custom look. The metal bracket is finished in a nice silver sheen and has mounting screw-holes if you want to attach your original optical drive's "mounting brackets" to our OBHD caddy (see photo below) .